BALE, Switzerland, March 22, 2019 /CNW/ -- Since the very start of their collaboration in 2011, Hublot and Ferrari have always created watches with a unique design and motorisation. Each new edition introduces a new style. 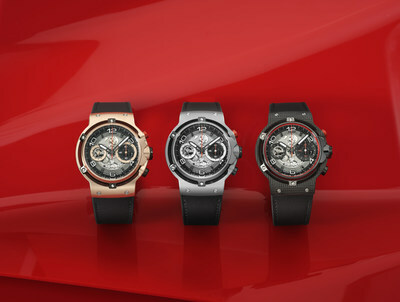 This year, Hublot presents an elegant and contemporary piece that draws inspiration from the "Gran Turismo" universe. The launch of the Classic Fusion Ferrari GT watch – with its extremely innovative design which integrates the new UNICO manufacture movement in a body with distinctive and dynamic lines - sees Hublot and Ferrari write a new chapter in their collaboration. The long-term collaboration between Hublot and Ferrari is one of a kind and an endless source of creative inspiration that builds on the common values these two prestigious houses share. The constant drive for innovation and refinement behind the unstoppable creative impetus of both Ferrari and Hublot has come to life in the Big Bang Ferrari, the MP-05 LaFerrari and the Techframe. The collaboration first drew inspiration from the racing world and Formula 1, with the Big Bang Ferrari editions. In 2017, Hublot and Ferrari expanded to the universe of GT, with the Techframe Ferrari Tourbillon Chronograph specifically created to celebrate the 70th anniversary of Ferrari. This year the collaboration goes a step further in this world, which has always defined a travel philosophy that combines tradition, elegance and technical perfection. "Driving over long distances at high speed in comfort and with style." This is what the "Gran Turismo" spirit is about. The term also defines a category of limited-production, very high-performance luxury cars. The GT world is one of innovation and refinement, with a passion for mechanics performance and innovation and an appreciation for elegance and beauty. To pay homage to the "Grand Touring" cars, Hublot and Ferrari have now combined for the first time their sense of aesthetic creativity and mechanical innovation in a Classic Fusion, a watchmaking chassis that is both traditional and modern, in line with the stylistic codes of the GT universe. Another first: the famous UNICO manufacture movement has been integrated into a 45-mm-diameter Classic Fusion case. This is the second of Hublot's own chronograph calibres, unveiled in 2018 (HUB1280). 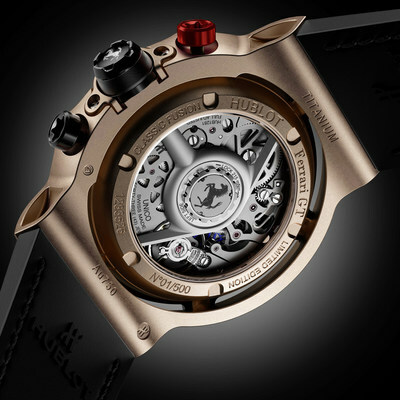 Protected by four patents, this self-winding flyback chronograph movement, with 4 Hz frequency (28'800 A/h) and a column wheel that can be seen from the dial side, has technical specifications that are fit for a champion with, in particular, a thickness of only 6.75 mm and 3-day power reserve that is very useful for day-to-day life. The entirely new Classic Fusion Ferrari GT is available in three different cases: Titanium (limited edition of 1,000 pieces), King Gold (limited edition of 500 pieces) and 3D Carbon (limited edition of 500 pieces). 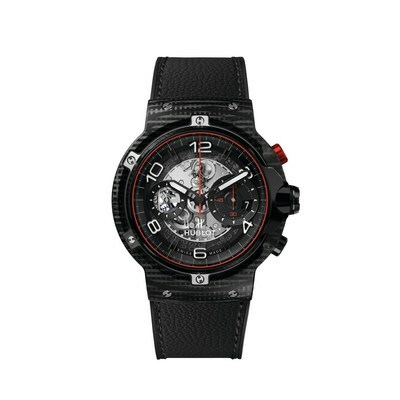 All-new in the Fine Watchmaking world, 3D Carbon is a polymer matrix composite (PMC) made of three-dimensional fibres. This high-tech material, which is very popular in motorsport, has outstanding qualities of resistance and, in the case of the Classic Fusion Ferrari GT, offers a lightweight but solid layer of protection, to the UNICO manufacture movement. Designed by the "Centro Stile Ferrari", the new Classic Fusion Ferrari GT draws inspiration from the GT designed and crafted in the Maranello workshops. 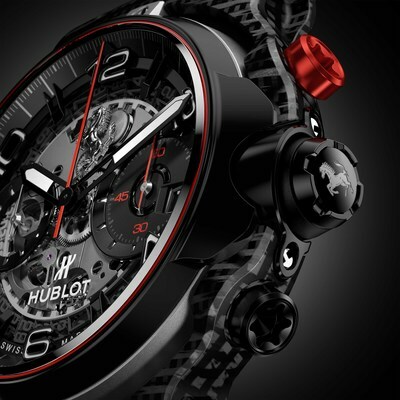 Its design is very contemporary; Hublot worked on the motor and Ferrari on the body. One of the main design features of the Classic Fusion Ferrari GT is the case, conceived as a true concentrical suspended element that enhances the dial presence and the sophisticated manufacturing making process. For this purpose, the "Centro Stile Ferrari" designers applied their expertise, building bridges between automotive design and watchmaking motorisation, and thereby proving that they love to work and surpass themselves on other projects than those linked to cars. Entirely different yet resolutely complementary to the Techframe launched in 2017, the Classic Fusion Ferrari GT is a watch for lovers of fine mechanical pieces who want to display a contemporary and refined style. The dial is transparent thanks to the use of sapphire crystal and reveals the high-precision mechanics of the UNICO HUB1280 calibre, with the famous Prancing Horse appearing at 12 o'clock. Each and every detail has been subjected to meticulous finishing touches like the red thread around the sapphire crystal with anti-reflective coating, a stylistic reference to the legendary Ferrari colour. The straps of the Classic Fusion Ferrari GT have been subtly created in black rubber and dressed in Schedoni leather, like the seats of the Maranello historical race cars. Round like a racing tachometer, the new Classic Fusion Ferrari GT is a piece for our time, with particular attention paid to the ergonomics and a thickness of only 13.15 mm, a rarity for an integrated flyback chronograph. This innovatively designed, airy watch of rare elegance opens a major new chapter in the partnership of excellence between Hublot and Ferrari. Founded in Switzerland in 1980, HUBLOT is defined by its innovation, which began with the highly original combination of gold and rubber. This "Art of Fusion" stems from the imagination of its visionary Chairman, Jean-Claude Biver, and has been driven forward by CEO Ricardo Guadalupe since 2012. The release of the iconic, multi-award-winning Big Bang in 2005 paved the way for new flagship collections (Classic Fusion, Spirit of Big Bang), with complications ranging from the simple to the highly sophisticated, establishing the extraordinary DNA of the Swiss watchmaking house and ensuring its impressive growth. Keen to preserve its traditional and cutting-edge expertise, and guided by its philosophy to "Be First, Different and Unique", the Swiss watchmaker is consistently ahead of the curve, through its innovations in materials (scratch-resistant Magic Gold, ceramics in vibrant colours, sapphire), and the creation of Manufacture movements (Unico, Meca-10, Tourbillon). HUBLOT is fully committed to creating a Haute Horlogerie brand with a visionary future: a future which is fused with the key events of our times (FIFA World Cup™, UEFA Champions League™, UEFA EURO™ and Ferrari) and the finest ambassadors our era has to offer (Kylian Mbappé, Usain Bolt, Pelé).